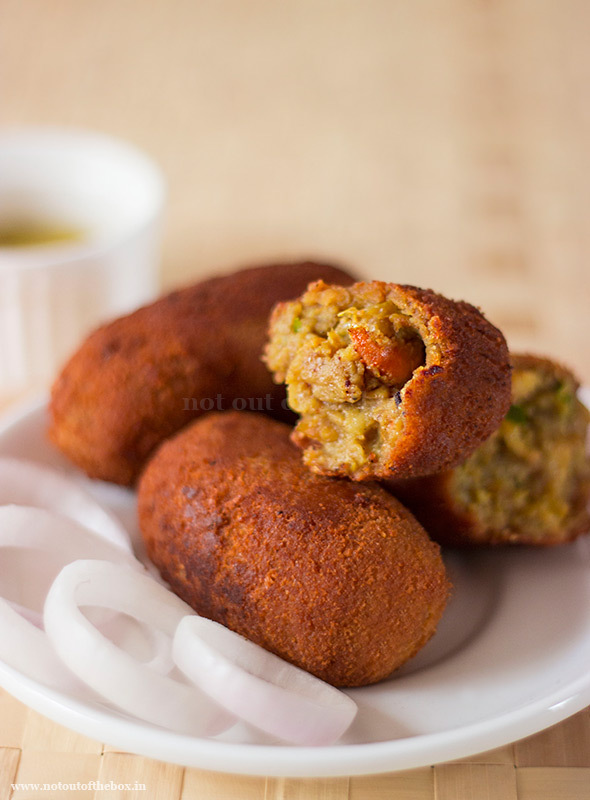 Like many other street snacks of Kolkata ‘Chingrir Chop’ aka ‘Prawn Croquette’ is one of my favorite. It’s not very easy to find good quality Chingrir Chop though. Many street vendors tend to fill the croquette with less prawn and more potato. So your experience may not be very peaceful, if you are thinking to try Chingrir Chop from any road side shop in Bengal or Kolkata. I was lucky to experience Chingrir Chop many times with a bowl of puffed rice (muri/murmura) along with a cup of hot tea in my old Kolkata days. There was a road side shop at my maternal uncle’s locality, whose owner Robi da used to make very nice croquettes, Chingrir Chop was most popular among all. 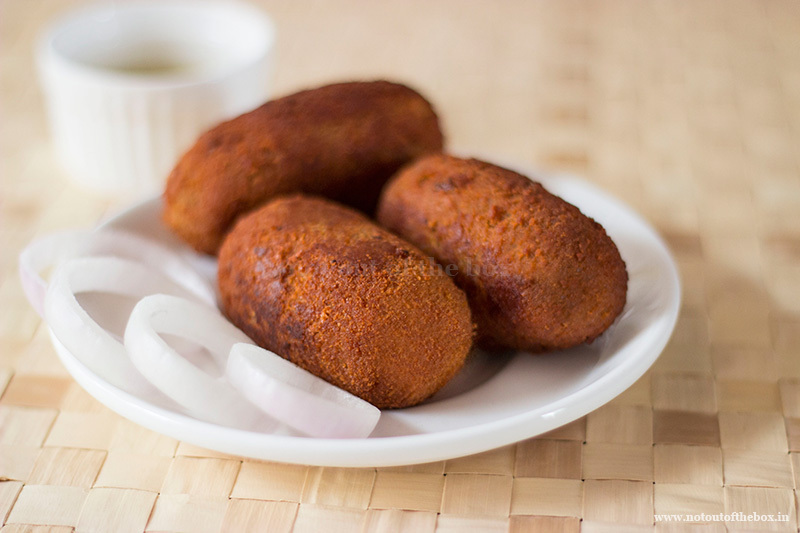 Those croquettes were crispy on outside, and made with a mouth watering filling, that filling was so well balanced in term of spices, prawns along with other ingredients that anyone who ever tried Chingrir Chop from that shop, couldn’t stop at one. In a bowl mash the boiled potatoes and keep aside. 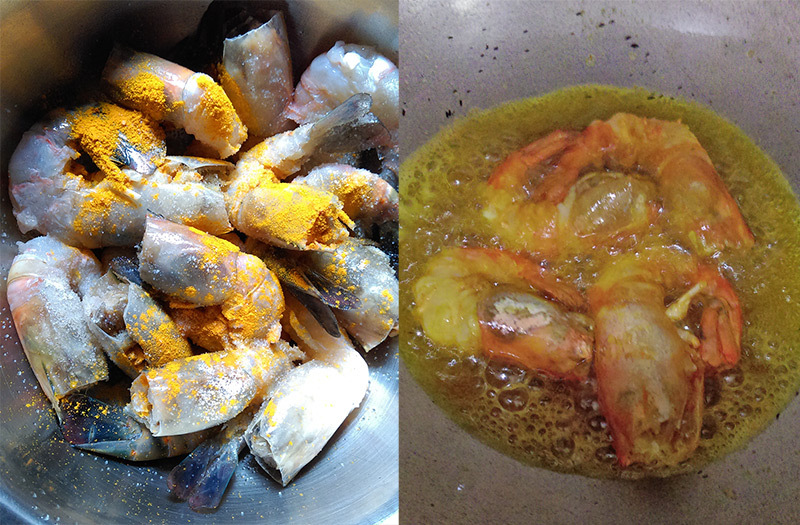 Wash and rub salt and 1 tsp of turmeric powder on freshly washed prawns. Keep aside. Heat mustard oil in a deep frying pan. Add the prawns, fry them on medium flame until golden in color. Remove and keep aside. 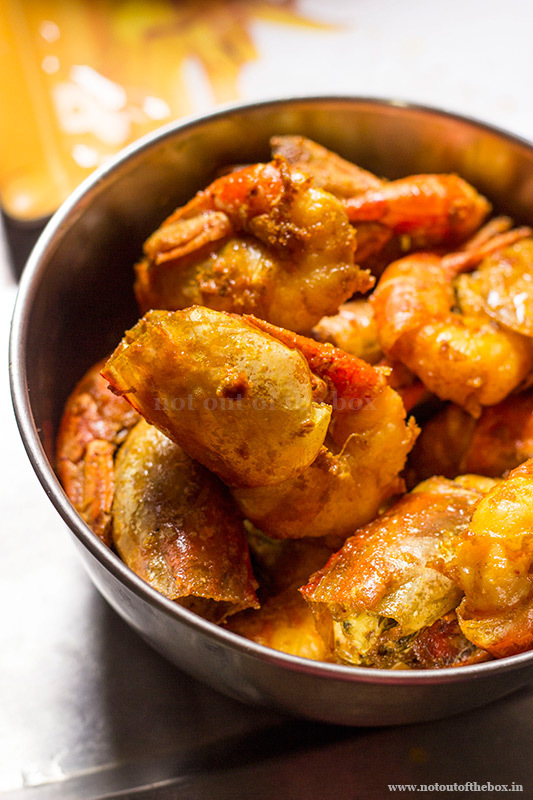 Prawns mixed with turmeric powder and salt. Then fried in hot oil. Let it be cooled little bit, now remove the head and tail part using your fingers, keep the prawn flesh only for making croquettes. Tear the prawn flesh roughly into pieces. If you are using small prawns, then you can keep them as it is, no need to tear them in that case. Now in the remaining oil (4-5 tbsp oil should be there, if not add some more). Add onion and fry on medium high flame until lightly brown in color. Add ginger-garlic paste, green chilies, coriander powder, cumin powder, turmeric powder, black pepper powder and salt. Mix and fry it on medium heat till the masala starts leaving oil (1-2 minute max). 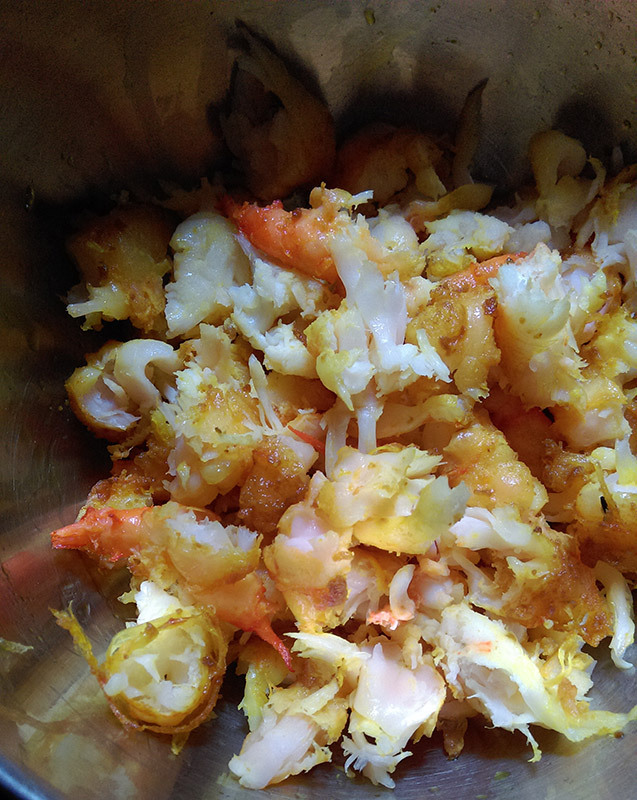 Add prawn pieces. Mix well, cook on low flame for 10-12 minutes. Keep stirring in between. Add mashed potato, mix well. Adjust salt, if required. Add sugar, cook for 2-3 minutes more. Add garam masala, mix and remove from heat. Keep aside. Let it be cooled. Make round or cylinder shaped chops/croquettes from this mixture, like this. In a bowl mix besan, water and salt. Mix to form a lump free batter. Dip each chop in this besan batter and then roll into ground cornflakes or breadcrumbs whatever you are using. Heat oil in a deep frying pan. Add 1 cup oil at a time. Fry the chops on medium flame until golden brown. Your Kolkata style chops are ready! Serve immediately with kasundi (Bengali mustard sauce)/tomato ketchup and some sliced onions. Why I fried these prawns with head and tail part on? Well, the head and tail parts add more flavor and taste into the oil, and that oil use to cook further for the croquette mixture. 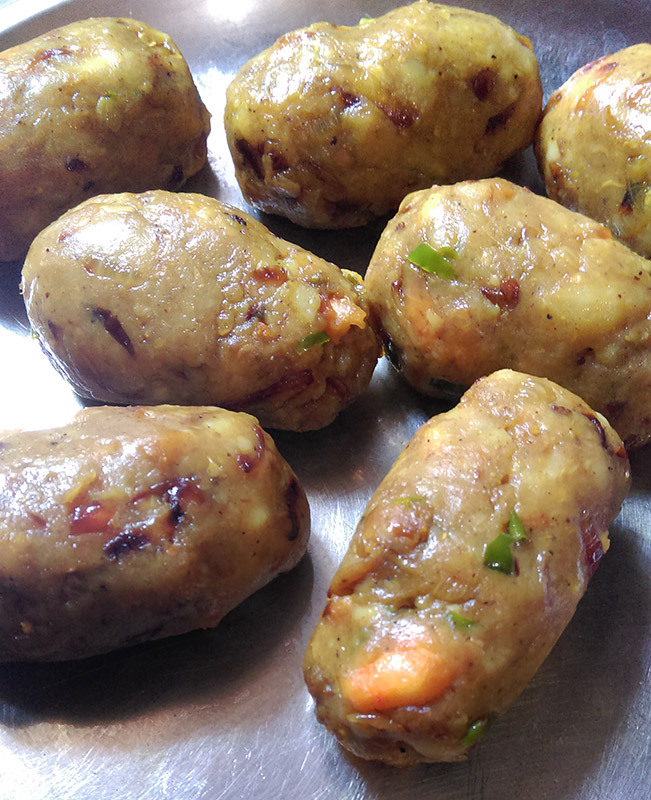 To make the croquettes eggless I used besan mixture as coating. And there was no difference in taste. But if you want to use eggs, just mix 2 eggs with little salt. Dip the chops and then roll into breadcrumbs. 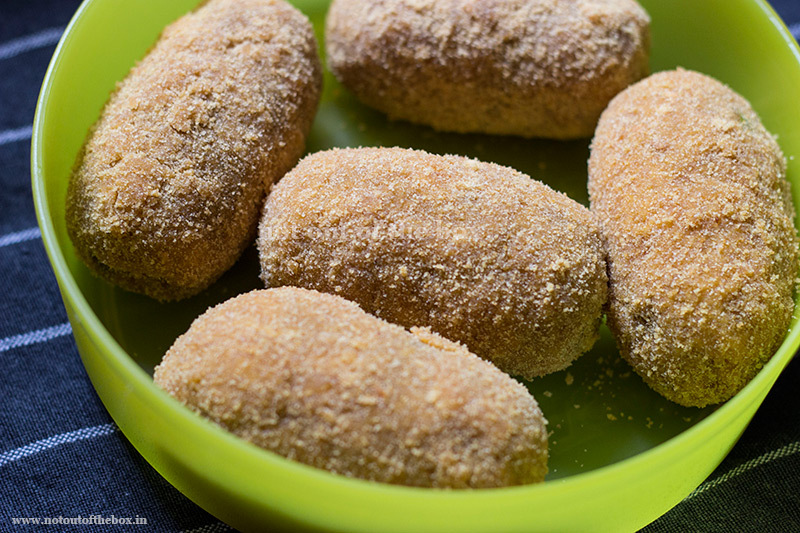 These croquettes can be made ahead, after coating store them in an airtight container, and keep in the fridge. They stay well for a day or two. Just take them out from fridge, fry and serve.